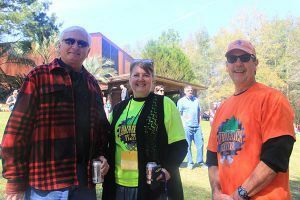 Ed Meadows, Pensacola State College president, from left, Anthea Amos, dean at the Milton campus, and Butch Branch, coordinator of Student Leadership and the LIFE Fitness Center in Milton, share a laugh during the 29th annual Forestry Conclave and Lumberjack Festival held Saturday, March 4, on the campus. 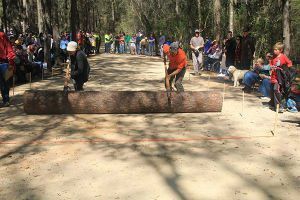 The event included forestry competitions such as log rolling, cross-cut sawing, knife and axe throwing, pulpwood tossing and more throughout the day. And for the less-competitive, there was plenty of bluegrass music, children’s activities, food, arts and crafts, and nature and wildlife exhibits.